Large quantities of elastomers are stored before, during and after the production process. These stored materials possess extraordinarily high calorific potentials of 30 - 45 MJ/kg compared to e. g. coal with approx. 30 MJ/kg. Thus, elastomer fires are almost uncontrollable because of the freed amounts of heat. The combustion effluents developing during a fire possess hazardous potentials for humans and environment (see Fig. 1). Combustion effluents of raw polymers, mixtures and vulcanizates (on base of NR, SBR, CR, BIIR, NBR and EPDM) are investigated for their qualitative, quantitative and time-dependent composition. Rubber fires are simulated and the important combustion parameters temperature, ventilation and surface/mass ratio of the samples are systematically varied. A VCI fire simulation apparatus (Fig. 2) is used which was developed by Bayer, BASF and Hoechst especially for chemical analysis of combustion effluents. The combustion effluents are collected using different sampling techniques and are analysed by means of complex chemical analysis methods. The past results and further research will enable a forecast and a estimation of hazard in the case of rubber fires. The diploma thesis was done from july 1996 until december 1996 at the Institut für Anorganische Chemie, Fachbereich Analytische Chemie, of the University of Hannover under the care of Mr. Prof. Dr. G. Wünsch. The experimental work took place at the Deutsches Institut für Kautschuktechnologie e.V. (DIK), Hannover. Special measurements were executed at the Institut für Technische Chemie of the University of Hannover, working group of Prof. Rotzoll. The financial support provided by the Wirtschaftsverband der deutschen Kautschukindustrie e.V. (W. d. K.) is greatly acknowledged. Rubber fires are hardly controllable due to the freed amounts of heat and possess risks for humans and environment because of the toxic combustion effluents, developing thereby. From february 1997 till november 1999 I worked on my doctoral thesis "Rubber fires - fire tests, analysis and assessment" at the Deutsches Institut für Kautschuktechnologie e.V. (DIK) under the care of Mr. Prof. Dr. G. Wünsch, Universität Hannover, Fachbereich Analytische Chemie. Investigations on combustion effluents of rubber had been continued. The financial support provided by the Wirtschaftsverband der deutschen Kautschukindustrie e.V. (W. d. K.) is greatly acknowledged. 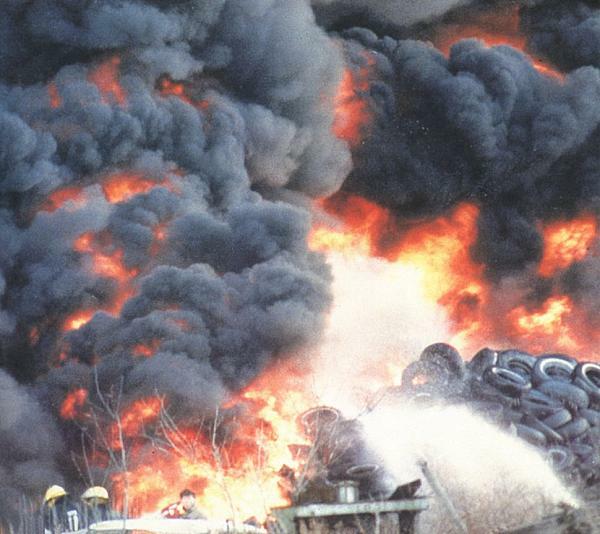 Rubber fires are extremly hot, difficult to extinguish and large amounts of fire effluents and smoke are emitted. Being able to predict the composition of fire effluents as a function of burning material and fire conditions is of great interest. Estimation of the hazard potential in the event of a fire and a judgement of compliance with statutes governing the storage of these materials would be possible. Thus, fire tests had been developed using laboratory scale apparatusses and fires of select common rubber materials were simulated. The composition of the combustion effluents of these materials were analysed qualitatively and quantitatively as function of combustion parameters (ventilation, temperature and surface/mass ratio). The fire gas composition and emission potentials of selected constituents in rubber fires were estimated and assessed toxicologically based on the results and published studies. N. Büthe; Untersuchung von Brandgasen an Elastomeren, diploma, University of Hannover (1997). N. Büthe, U. Giese, R. H. Schuster and G. Wünsch; "Firegases of Rubber Materials - A Systematic Investigation", poster presentation at the International Rubber Conference '98, Paris, CNIT La Défense, 12. - 14. May (1998). N. Büthe, U. Giese, R. H. Schuster and G. Wünsch; "Firegases of Rubber Materials - A Systematic Investigation", poster presentation at the 3rd Kautschuk-Herbst-Kolloquium, Hannover, Maritim Stadthotel, 15. - 17. October (1998). N. Büthe, U. Giese, R. H. Schuster and G. Wünsch; "Combustion Effluents of Rubber, I. - Chemical Analysis of Compositions and Influence of Combustion Parameters, Kautsch. Gummi Kunstst., 53, 1-2 (2000) 42-51. Nicholas Büthe, "Elastomerbrände - Modellbrandversuche, Analytik und Bewertung", doctoral thesis, University of Hannover, 1999. Nicholas Büthe, U. Giese and R. H. Schuster; "Rubber fires - composition of effluents and influence of parameters", lecture given at the 4th Fall Rubber Colloquium, 2000/11/07 in Hannover. Questions about my research topic ?